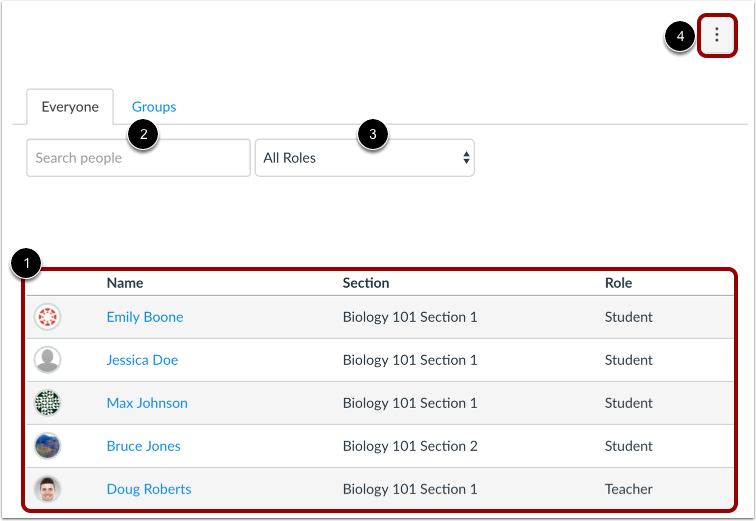 How do I use the People page in a course as a student? People shows all the users enrolled in the course. View all the users participating in the course, including the ones whose course enrollment is pending. Use the search bar to find a specific person. Use the drop-down menu to filter users by role. The filter will also display the number of users in each type of role [e.g. student, TA]. Use the Options drop-down menu to view user groups or registered services in the course. To search for a specific user, start to type the user's name in the search field . Possible results will be listed below . Use the Roles drop-down menu to view the number of users for each role type. To learn more about a specific user in the course, click the user's name. Clicking your own name provides access to your grades. You may also be able to view your own course analytics. You can view any details the user has included. You can also send a message directly to the user. If your institution supports the Profiles feature, the page displays slightly differently. You can view the user's profile information, if any. If your institution supports profile pictures and the user's profile picture is inappropriate, you can report the image to your institution by clicking the Report inappropriate picture link . If your institution supports the Profiles feature, you can report the image by hovering over the picture and clicking the Flag icon . To view User Groups, click the Groups tab. You can also access your User Groups in the Settings menu. Click the Options icon , and click the View User Groups link . To view the registered services for each person in the course, click the Options icon , and click the View Registered Services link . If a person has registered a social media account in Canvas, you can see that service listed and communicate with that person through any social media site they have registered. Learn how to connect to web services in Canvas. Previous Topic:How do I view the history of a page in a group? Next Topic:How do I view my course analytics as a student? 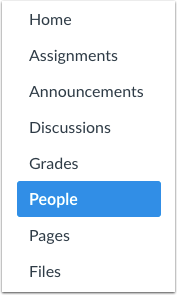 Table of Contents > People and Groups > How do I use the People page in a course as a student? Re: Why can't my students see the list of groups available to join for self sign-up?